Expert Quality, comprising a driver, adaptor and a selection of 1/4" insert security bit types generally available on the market. The Draper TX-STAR and hexagonal bits have a hole drilled in the bit to take the pin of the security fixing. The insert bits (25mm long) are manufactured from S2 steel hardened and sand blasted. Bit holder made from aluminium with chrome vanadium steel shaft. Packed in a handy plastic storage case. 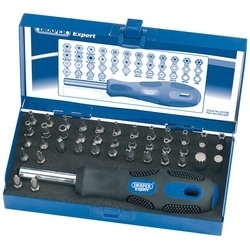 Draper TX-STAR products and security bits are compatible with †Torx fixing systems. 6 imperial hexagonal security bits size: 5/32, 9/64, 1/8, 7/64, 3/32 and 5/64"